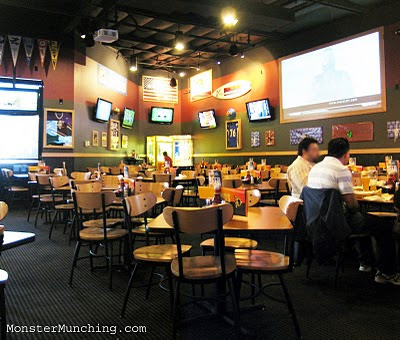 I didn't plan to eat at Buffalo Wild Wings, but I did, and I liked it. It's everything that every American craves. It's fried. It's chicken. It's served in a dark room with multiple flat screens tuned to sports. And on Boneless Thursdays, the boneless wings are discounted to 65 cents each, which again, I didn't plan on. But as a frugal American, a discounted fried chicken meal is better than one at full price. 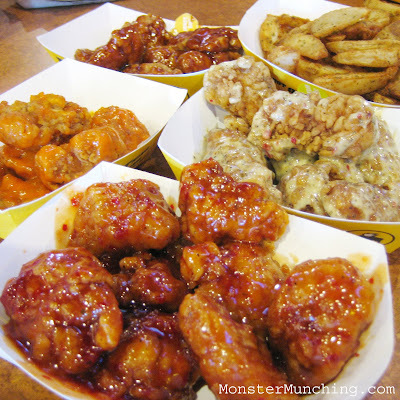 But, as you know, "boneless wings" are a misnomer. They're just breast meat pieces, skinless, cut into nuggets, and covered in batter. No need to work your teeth around the bones (though, frankly, it isn't as much fun). All that's required that you order in multiples of six for each saucing option, and oh yeah, a fork, lest you want your fingers all gunked up for no reason. We took the Asian Zing, the Medium, the Honey BBQ, and the Parmesan Garlic, along with a basket of herb-dusted potato wedges, because if you're eating fried chicken, why not fried potatoes also. The Asian Zing was shellacked in a tooth-rotting, diabetes-causing, overly-sweet syrup that apes the Orange Chicken from Panda Express, but what I suspect is bottled Thai chili sauce -- good, but in dire need of steamed rice. The Honey BBQ was similarly sugary, with a smoky finish, and went well with shoved mouthfuls of the salty potato wedges. The Medium sauce tasted typically of wing sauce, vinegary, punctuated by Tabasco-y hotness. The Parmesan Garlic was tame, well-mannered, and looked weirdly white under the sauce -- my favorite since it actually tasted Italian...sort of. I ate it giddily, greedily, and guiltily, often forgetting the fact that what I was enjoying was a glorified McNugget. Christmas rush in full swing. Doing ever the same thing. We aimlessly wandered from store to store, building up quite a thirst. We still had lots to do, but we said, "Let's get a drink first." 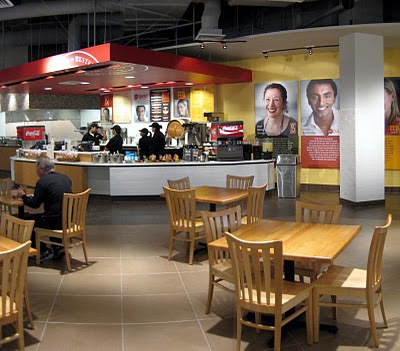 The closest thing was Macy's Signature Kitchen at the time. It would do, we said; her for a cola, and I, lemon lime. But it was on the Marc Burger menu that I found a much better treat. So we settled on free water; our calories, we would eat. But from here on out, I'll know it for its custard! Again this wasn't ice cream, not frogurt, or soft serve. But it is frozen like them all; softly piped tall to a curve. Into which the yolk of a hen's egg must be beaten. The color is a dull, creamy yellow, like unburnt creme brulees. It's also just as rich, ideal then, for sharing two-ways. Its creaminess blooms in the mouth with a fullness of flavor. The vanilla slowly melting, every drop precious, to sip and to savor. 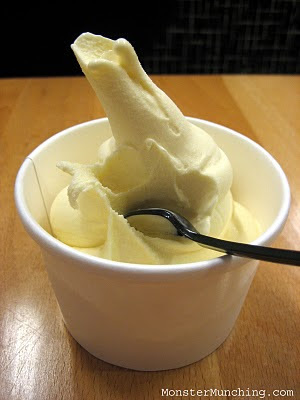 You don't often see frozen custard like this, not around here. It's the egg, you see, it's the salmonella they fear. The cheapest thing on the menu, and the last thing you'll see. So after our treat, we were happy and continued on shopping. Oh by the way, the dessert is served sans any topping. It's better that way, pristinely calming and all. Now if only I could say the same for the mall. 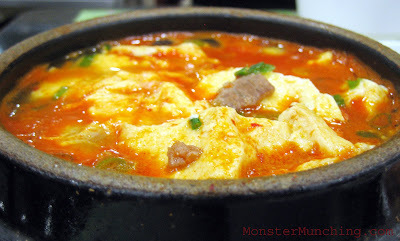 Is there anything more satisfying during cold wet weather than Korean soft tofu soup? I think not. If you've read this blog for a while, you might have anticipated this post. With a few exceptions, I eat in accordance to weather conditions, and when it comes to soondubu, I'm of the opinion that it tastes best when you're freezing, and thus should be reserved until the thermometer reads south of 70 degrees and the roads are slicked with rain. 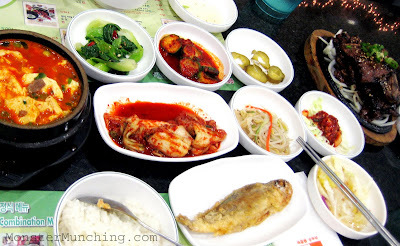 This week, with the local newscasts hyping its StormWatch coverage, BCD Tofu House was the place for us to have it. We ran in a few nights ago, straight from work, hands shielding our heads from the downpour. Our damp, wind-chilled faces were ready to be defrosted by slurps of hot soup. And out it came, served out of a thick, cast iron pot in which it was simmered in -- a red, chili-spiked broth sputtering and boiling like an angered volcano goddess out to avenge. We cracked a raw egg into it like a virgin sacrifice. It swallowed it, gulped it in. We did the same with the soup. We scooped out spoonful after quivering spoonful of the bean curd, blowing on it before we passed the white, soybean nectar through our lips. Then we sipped the thin, scalding brew. Beads of perspiration began to form on my brow. It took five minutes for me to go from hypothermia to toasty warm to sweating. The kimchi helped me along. 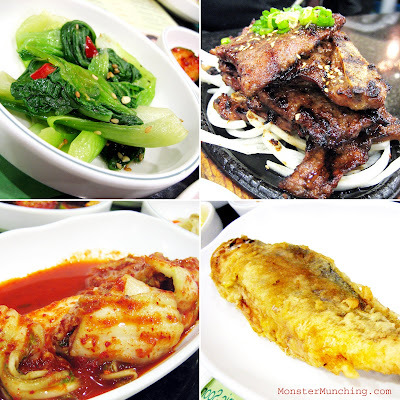 Other panchan side dishes -- like the cold, marinated baby bok choy -- refreshed. Shortly thereafter, a particularly unctuous but chewy kalbi arrived in a tall stack (it was a part of a combo we ordered to share) itself heated on a bed of onions sizzling on blazing cast iron plate. A yellow croaker, a whole tiny fish battered and deep fried, was nice too -- another protein to mash into the steamed rice. There was also cucumber covered in gochuchang, bean sprouts marinated in sesame oil -- all prefunctory dishes we've come to expect from places like this, but nothing that we haven't seen done better or with more variety elsewhere. Irvine, after all, is a town with no shortage of Korean soft tofu restaurants. There are at least six. BCD is part of an L.A. chain, but this newest outlet at Irvine's Diamond Jamboree distinguishes itself by being one of a few things that is open 24-7 in the city. Service, as a consequence, is less than obsequious. What's done is what's required: they take your order, give you your food, and later, the check. Water is only refilled when you ask (they give you a jug). And I'm not sure they are inclined to give you more panchan if you request it. But the soup was there: all that we needed, exactly when we needed it. And that's all that mattered. Ah, Memphis' buttermilk fried chicken! Here is a dish so unbelievably great, Gustavo Arellano once proclaimed during a lunch meeting at the restaurant, "I can't have that anymore. It's too good!" I had it again recently and I did then and still do agree that it is too good, except I order it any and every chance I get. This, ladies and gents, is the way fried chicken should be. There is no bucket, no mascot, and the bird comes practically deboned. But if you think that it's some frou-frou deconstruction of a classic, you'd be wrong. Memphis' fried chicken plate might just make a displaced Southerner weep from his meemaw. What you get is a meal as traditional as it is gigantic. A study of balance and excess, it starts with a flattened, boneless breast covered with a shimmering, crispy, flaky, golden chainmail of breading -- what I consider the "original" original recipe. About the only bone you'll encounter is in the wing drumlet, which is attached as an extra treat to nibble on for dessert. Though there is no dark meat here, every well-cooked molecule of it is moist and juicy. The flavor is slightly tangy from an overnight soak in buttermilk. 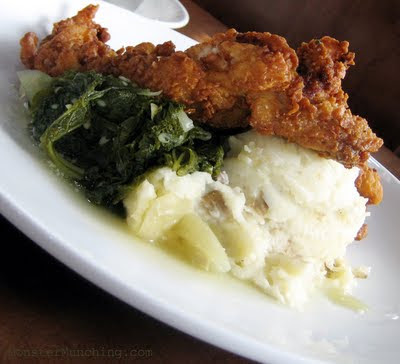 Then, beneath the swooping shadow of the golden fried breast, there are the sides that complete the dish: a scoop of rustic mashed potato as starch, a heap of pot-stewed mustard greens as a bitter counterbalance, and a lighter, more refined version of country gravy to slather over everything. And when I say more refined, I mean it. Do not expect the standard caramel-colored glop that tastes like it came from a bouillon cube. Once I polished off my plate and squeegeed every speck that was left, I longed for another. Like Gustavo said, the dish really is too good.